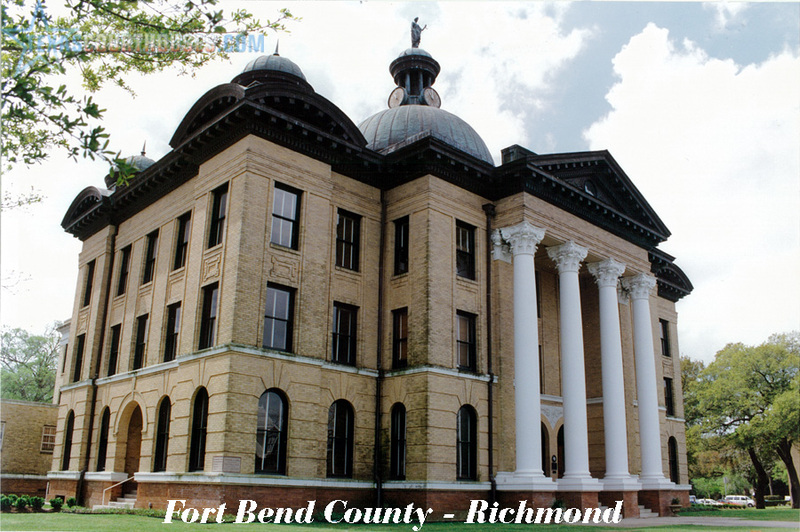 Erected in 1908, the Fort Bend County Courthouse is one of the fine examples of classical revival architecture found in Texas Courthouses of this period. Located in Richmond, Texas, the courthouse is the visual as well as governmental focal point of the County. Its domed roof dominates the silhouette of the town, and can be seen from miles around. Designed by C.H. 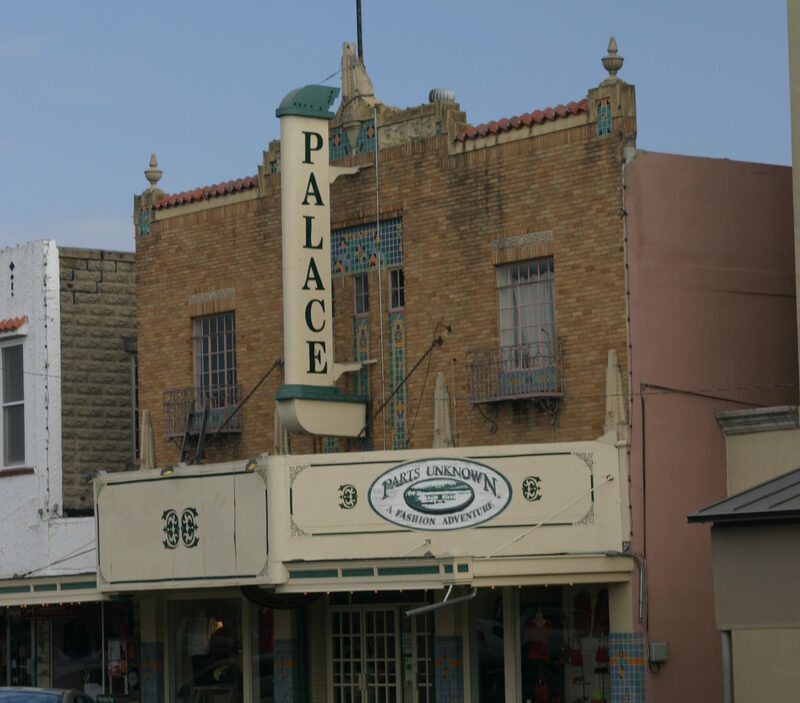 Page and Brothers of Austin, the original building is a three-story masonry load bearing structure with a raised concrete foundation. It has had two major additions, the first in 1935, the second in 1957. While the form of the courthouse is imposing from the street, several elements give scale and visual interest to the building. A slight projection of the corner bays emphasizes the verticality of the structure and relieves its massiveness. The first floor of the building, capped with a stone band, is treated with rusticated brick courses which give a play of light and shadow and create a strong horizontal band. Emphasis to this band is given by the use of arched windows in contrast to the rectangular windows on the second and third floors. A three-story projecting portico with stone columns and intricately carved stone capitals forms an impressive entry from Jackson Street. Three arched openings capped by a rich stone carving lead from the entry portico to the central rotunda. The roof is one of the most impressive aspects of the building. Though now painted silver, the richly articulated dome and facial are copper, which will be restored to their original condition. The clock tower is topped by a copper statue of “Miss Liberty” holding a sword and scales of justice. Windows are simple one over one wood double hung windows with simple wood trim arranged in a symmetrical manner. Entrance doors are beveled glass and wood with arched glass transoms. The plan of the Courthouse is a cruciform floor plan centering on a three-story high skylit rotunda. All major courthouse functions were originally entered through this light filled space. The ornate wood and metal handrails on the balcony of this rotunda and the adjacent stair are especially rich. With the exception of this area, the architectural character of the Courthouse is functional and simple. Walls and ceiling of the original building are predominately plaster, floors and wood, and a simple mosaic tile. The corridors and lobby have a glazed brick wainscot, while other walls have wood picture trim and wainscoting. The interior has a feeling of elegant simplicity and restraint that was appropriate to the County whose roots were predominately agricultural. Simple wood trim, wainscoting and wood picture mold is used throughout the original courthouse structure. The original light fixtures were combination gas and electric brass pendant fixtures. These were replaced through the years with simple incandescent “schoolhouse” fixtures and fluorescent pendant lights. In 1935 a three-story addition was made to the south wing of the courthouse. The detailing of both the exterior and interior of this concrete frame addition is less articulated and materials used simpler than the original. The fascia and parapet are stone rather than copper. The brick detailing on the first floor band is less articulated, the horizontal banding having been eliminated. Windows are simple one over one double hung similar to those in the original wood building, but with minimal interior trim. Walls are plaster with picture mold but no wainscoting. Floors are terrazzo throughout. It was during this time that the second floor balcony was removed and the original light fixtures replaced. The addition was originally planned as a four- story addition incorporating the jail on the top two floors. This scheme was revised just before construction began. In 1957, a one-story addition was made east and west of the 1935 addition. This addition was very economical and of less architectural quality than the 1935 addition. There is virtually no exterior articulation. Windows are three pane projecting aluminum. Floors are terrazzo and walls plaster. It was at this time that air conditioning was added to the building, resulting in exposed ductwork and piping throughout the building. To meet the expanding needs of County government, an annex to the Courthouse was recently constructed. This annex, located across the street from the Courthouse, will house the tax office, Commissioner’s Court, and various small departments, while all other courts and related activities will remain in the original Courthouse. Major adaptive restoration of the Courthouse is planned, including new mechanical, electrical, and plumbing systems, and elevator and stairs which are needed to meet current code requirements for fire and handicapped. A new stair and toilet core is planned with minimal change of the original structure. This adaptive restoration will allow the majority of the public spaces of the Courthouse to be restored similar to their original condition. Exposed ductwork and piping in public areas will be removed and those areas restored to their original condition. While lighting in the major public areas, the rotunda, hallways and courtrooms will be brass pendant fixtures similar to the original, the District and County Clerk and the majority of the offices will have suspended upright fluorescent fixtures which will provide indirect lighting from the ceiling. Fans similar to those once hanging in the Courthouse will be installed in all high ceiling areas. The skylight covering the central rotunda, which was covered over several years ago, will be restored to its original condition. The tin ceiling in the large courtroom will be replaced with a design similar to the original. Some replanning of the building will be necessary to provide for the growing court system. A new courtroom will be added on the second floor with adjacent judges chambers and jury room. Judges chambers and jury rooms will be added adjacent to both second floor courtrooms. A law library and a small balcony will be added to the large second floor courtroom to replace a large balcony which had been removed during the 1935 addition. Provision for future expansion of the court system has also been made. Two additional courtrooms can be added, a small one on the first floor by relocating the Justice of the Peace, and a large one on the third floor by relocating the District Attorney’s Office. In this way the Courthouse will not only be restored to its original condition, but will continue to function as a courthouse for years to come. A fine example of classical revival architecture, the Fort Bend County Courthouse is a focal point for a county with rich historical roots. The impressive character of its architecture reflects the high degree of importance once placed on local county government. The Courthouse is the focal point for a city with a rich history. Formed from a land grant from Stephen F. Austin in 1837, Richmond was the site of one of the original colonies in Texas, “The Old Three Hundred”. It was home to several figures prominent in Texas history including Jane Long, “Deaf” Smith, and Mirabeau B. Lamar. Fort Bend County has had five courthouses since 1937, the current structure having the greatest longevity. Commissioned in late 1907, the present structure has served as the Fort Bend Courthouse since it was dedicated in 1909. The architect was C.H. 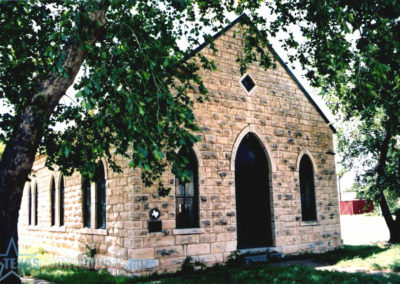 Page, Jr. and Brothers; it was built by the Texas Building Company for a cost of $75,000. It has seen happy occasions such as the tallying of votes on election night and the inauguration of public officials; it has also seen times of sadness when it was the only building in Richmond not devastated by floods. It has served such public servants as Bob Basset who, at the time of his retirement as District Attorney for the 23rd Judicial District, was considered dean of District Attorneys in the United States. There are several aspects of the Courthouse that are especially significant. Although the materials, both exterior and interior, are relatively modest, the Courthouse is the dominant architectural element in Richmond. It is the tallest structure in town, and its domed roof can be seen from miles around. The restoration of this important landmark is especially important because of the sharp increase in growth in the County, which is just a few miles west of Houston. It is hoped that the County can retain the appreciation of its rich historical roots as it grows in size and complexity.